New Hampshire primary live-blog: news, analysis, and results from the Republican, Democratic races. 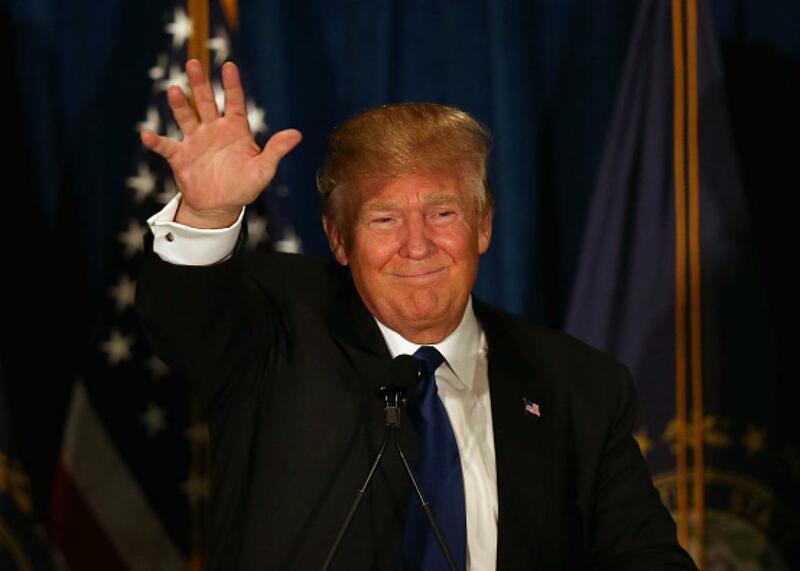 New Hampshire Republicans make Donald Trump a winner. 11:30 p.m.: Trump and Sanders take New Hampshire, and that’s a wrap. Thanks for following along with our live blog Tuesday night. We’ll let the respective winners of the New Hampshire primaries, who are also the two main anti-establishment figures in the race, have the last word. 11:15 p.m.: Marco Rubio concedes his terrible debate performance was costly. The question now becomes whether it’s too late for any future debate performances to make up for Saturday’s debacle. Rubio had been one of the strongest performers at previous debates, but that polished persona devolved into what came off as a complete lack of authenticity and spontaneity. Rubio was stuck in fifth-place in New Hampshire for much of the night behind rivals Ted Cruz in third and Jeb Bush in fourth. With 68 percent of the precincts reporting, Cruz had just a little more than a 500-vote edge over Bush, who held a more than 1,000-vote lead over Rubio. The Florida senator was in third in the last major South Carolina poll taken last month. Bush was only 5 points behind him in that poll, though, and he is doing an ad push in the Palmetto state featuring the last Republican president, who also happens to be his brother and a former victor in the state’s priamary. If Bush is able to take that momentum and capitalize on his brother’s remaining goodwill in the state and surpass Rubio in South Carolina, Rubio might not recover. Meanwhile, New Jersey Gov. Chris Christie, who bet everything on New Hampshire, looks likely to finish well behind the field in sixth. The Hill reports that he’s returning to his home state to weigh his options, which seem likely to involve ending his campaign at some perhaps not-too-future date. Kasich meanwhile, will go onto South Carolina and potentially cause major headaches for the other establishment candidates in the GOP field without necessarily doing much more than that for himself. In his own concession speech—which sounded more like a victory speech at times—Ted Cruz seemed to specifically nod to the uphill climb facing his more moderate rivals, like Kasich, in South Carolina. “The real winner is the conservative grassroots, who propelled us to an outright victory in Iowa and to a far stronger result and outcome in New Hampshire than anyone had predicted,” he boasted about maybe finishing third-place. “Now we go on to South Carolina. The Palmetto State. And, you know, Washington liberals may find South Carolina far less hospitable environs.” Cruz was in second in that NBC/Wall Street Journal South Carolina poll last month with 20 percent of the vote behind Donald Trump’s leading 36 percent. 10:00 p.m.: Kasich claims crucial second-place. A big call in the Republican race: The Associated Press, Fox News, CNN, and the Washington Post have called second-place for John Kasich. With 44 percent of the precincts reporting, the Ohio Gov. was at 16 percent of the vote, well behind Donald Trump’s 34 percent of the vote. It was a three-way battle for third-place, with Ted Cruz maintaining that critical position with 12 percent, Jeb Bush in fourth with 11 percent, and Marco Rubio in the potentially catastrophic fifth-place position with 10 percent. Kasich bet everything on New Hampshire, a la Jon Huntsman in 2012. But for Kasich, the bet actually paid off and he will leave New Hampshire almost as if he had won it. The problem for Kasich and his centrist reputation, though, is the next contest is in conservative South Carolina, where the last NBC/Wall Street Journal polling as of Jan. 23 had him in ninth-place at 1 percent (behind two candidates who have since dropped out of the race). Tuesday was a good night for Kasich and one that will allow him to stay in the race, but it’s hard to imagine that it was a good enough night to overcome those odds. 9:30 p.m.: Hillary gives pointed concession speech. Hillary Clinton just gave an impassioned concession speech after losing the New Hampshire primary to Bernie Sanders, promising to fight for every vote in future Democratic contests and already seeming to lay the groundwork for a potential general election race. She continued to present herself as the pragmatic option as compared to her challenger, who she implied has inspired voters who feel resentment towards the political establishment. Clinton also made a plea to the youth vote that appeared to carry the socialist candidate to victory in the first in the nation Democratic primary. She will need these voters’ support if she does make it to the general election, and part of her message was directly to them. “I know I have some work to do, particularly with young people, but I will repeat again what I have said this week: Even if they are not supporting me now, I support them,” Clinton said. African-American parents shouldn’t have to worry that their children will be harassed, humiliated, even shot because of the color of their skin. Immigrant families shouldn’t have to lie awake at night listening for a knock on the door. LGBT Americans shouldn’t be fired from their jobs because of who they are or who they love. And let’s finally deliver something long overdo, equal pay for women in this economy. It was a pretty effective speech, but the results on Tuesday probably spoke more loudly. 9:00 p.m.: Bernie’s win is going to be a big one. With 25 percent of the results in, Bernie Sanders is at a whopping 58 percent of the vote to 40 percent for Clinton. (Where is that final 2 percent going? Martin O’Malley, write-ins, and lesser-known candidates. Vermin Supreme has 65 votes and counting.) If those numbers hold, or if the lead expands for Sanders, it would be fair to call this win a shellacking. Read more about what Bernie’s big win means here. Cook Political Report’s Dave Wasserman also had a very good point about what these results might mean going forward if they hold up. Bad news for Hillary: she's on track to get clobbered tonight. Good news for Hillary: Marco Rubio is on track to get clobbered tonight. 8:30 p.m.: Trump runs away with win, Rubio’s numbers look bad. Trump is scoring a runaway victory—with 10 percent of the precincts reporting, he has 34 percent of the vote. Trump’s final RealClearPolitics polling average in New Hampshire was 31.2 percent and he’s running ahead of that at the moment. The race for second is very tight and early on does not look good for Marco Rubio and Chris Christie, the two men whose sparring in the final GOP debate before this contest looked like they might do damage to Rubio. Ohio Gov. John Kasich was holding on to second-place early on with 16 percent. Jeb Bush, meanwhile was sitting at third with 12 percent, Ted Cruz was at fourth with 11 percent, and Rubio was languishing in fifth with 10 percent and Christie was behind him with 8 percent. If there’s one consolation for Rubio, who was until last weekend the clear establishment favorite in the race, in potentially finishing in fifth it is that at least that it appears it won’t be by that big of a margin. That’s not much of a consolation, though. 8:03 p.m.: Bernie and Donald win already. The exit polling was enough for the networks to confidently make the very early call for Bernie Sanders, and more surprisingly for Donald Trump. The moment the polls closed, CNN projected victories for Trump in the Republican race and for Sanders in the Democratic one. The early Sanders win was expected, but the early Trump win was not necessarily a given. We’ll have updates from both victory speeches and from Hillary Clinton’s concession speech, along with more raw numbers and the all-important placings in the GOP race as soon as those become available. But this early a call can only mean good things for Trump and Sanders’ respective vote totals in New Hampshire. Sanders will ride a giant-slayer narrative into the Nevada caucus a week from Saturday, while Trump heads into that Saturday’s crucial South Carolina primary solidifying his position as the favorite. 6:32 p.m.: Early exit poll results are in. The early exit polls appear to look good for the favorites on both sides, namely Bernie Sanders and Donald Trump. MSNBC is reporting that, according to its early exit polls, Sanders was beating Hillary Clinton 83-16 among voters under 30 and only trailing her 58-41 among voters 65-and-over, who should make up a hunk of Clinton’s base. In another good sign for Sanders, ABC News reported that 7 in 10 Democratic voters in its exit poll described themselves as liberal, up from 56 percent in 2008 when Hillary pulled out a surprise come-from-behind victory over Barack Obama. On the Republican side, the early exit polls from a couple of networks look good for the Donald. Among first-time primary goers, MSNBC is reporting that Trump had a commanding lead with 36 percent in its exit polls, with John Kasich in second at 18 percent, and Marco Rubio and Ted Cruz sharing third at 13 percent. Another bad sign for Rubio: 64 percent of GOP New Hampshire voters in MSNBC’s early exit polling said that the recent GOP debates—in the last of which the Florida Senator had an epic malfunction—were either the most important or an important factor in their votes (10 percent answered most important). Also potentially bad for Rubio: ABC News reports that nearly half of the GOP voters in its exit poll only made up their minds in the last few days. In further positive news for Trump and bad news for society, though, MSNBC reported that 66 percent of New Hampshire Republican voters in its early exit polls agreed with the mogul’s vile “ban all Muslims from entering the country” plan to 31 percent who would oppose such a plan. That number was in line with ABC News’ own exit polling. The state party awards delegates on a proportional basis to presidential candidates based on their vote statewide and by congressional district. But it also has a 10 percent threshold. What does that mean? It means that if a candidate does not get 10 percent of the vote, he gets no delegates. (And this is a hard threshold — no rounding.) What’s more, not only do those underperforming candidates get no delegates, but whatever delegates they could have gotten based on their vote share go to the winner of the primary. We’ll have to wait for the final tallies but the latest RCP polling average suggest things will be tight for anyone not named Donald J. Trump. Marco Rubio’s polling at 14.0 percent, John Kasich is at 13.5 percent, Ted Cruz’s at 11.8 percent, Jeb Bush’s at 11.5 percent, and Chris Christie’s at 5.8 percent. There are only 23 GOP delegates at stake, though, so much like the Democratic contest, the narrative-shaping final standings will matter more in the near term than the delegate math will. [Trump] now says that it “doesn’t matter” whether he wins New Hampshire or not. Of course, it does, as he knows. Blowing Iowa and then blowing New Hampshire would send a strong signal that Trump is blowing—or already has blown—his campaign for president. But Trump on Monday excised the usual segment of his program where he brags about poll results for several minutes. Instead, he just celebrated what he had built, brought his wife Melania and daughter Ivanka onstage to say a few words, and offered an endearingly macabre pep talk for supporters on a snowy night with slippery roads. Assuming the polls aren’t wildly off the mark, Sanders should post a rather easy victory tonight (see update below). Still, while Sanders is the clear favorite, I will note that eight years ago state surveys showed Barack Obama with an 8-point lead on Hillary in the days before the New Hampshire primary. When the counting was over, though, Clinton came out on top by 2.6 points. I’ve seen no evidence that Hillary is due for a repeat performance this year, but if she does pull the victory out of nowhere, it could be a fatal blow to Bernie’s candidacy. If Sanders can’t win in Iowa or New Hampshire—where the Democratic electorate skews white and liberal—it’s unclear where he can. Sanders can, and would, fight on—but it would be hard to see him as a legitimate threat to Clinton. Given Clinton’s lead in the super-delegate race, Sanders will likely need every delegate he can if he’s going to claim the nomination this summer. Still, Bernie’s margin of victory in New Hampshire is likely to matter far less than the victory itself given how it will shape the next 11 days before the Nevada caucus. There will be time for counting delegates later; Sanders needs a win tonight to help ensure he’s still around when that time comes. Kasich and Christie are both hoping to top Rubio, Bush, and each other in the final standings tonight. But it they fail to put enough distance between themselves and their establishment-approved rivals, all the motivation in the world will mean little if they can’t find the money to pair with it. Texas Sen. Ted Cruz, Ohio Gov. John Kasich and New York businessman Donald Trump have nine votes each from the three early-voting towns — Dixville Notch, Hart’s Location and Millsfield. Mr. Sanders, the Vermont senator, has 17 votes to Mrs. Clinton’s nine. Original post: Is Donald Trump a paper tiger or a primary force? Will Marco Rubio make everyone forget about his glitchy debate performance on Saturday? Can Bernie Sanders notch the race-altering victory he needs to stay on his narrow path to the nomination? We’re about to find out. Voting is already underway in New Hampshire, where most polls will remain open until 7 p.m., and a few more will keep the lights on until 8 p.m. Slate will be live-blogging the action all day and into the night. Here you’ll find running updates of news, analysis, and results. Is Jeb Finally Hitting His Stride? Maybe!